As I come to the end of my placement at the RAS I leave with a greater knowledge of photographic collections and the diversity of tasks required for the care of them, but also a sense of achievement for the tasks encountered and completed during my time here. I have mainly been working with the Stein collection, the largest photographic collection the RAS holds, and completed the task of cataloguing, cleaning, packaging, and creating an archive box for all the images, including ones which were previously unidentified. This week I have created a new display for the Reading Room, selecting striking Stein images to highlight, and subsequently tweeted about the display to encourage researchers. I have also uploaded a webpage highlighting the photographic collection showcasing the fascinating Stein collection to draw attention to it and give researchers an indication of the collection as a whole. 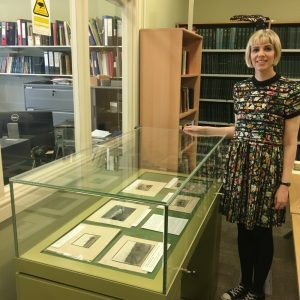 Working with the Stein collection has been very informative, I knew nothing about him before undertaking my placement and have enjoyed researching the publications, working with and studying the photographs. 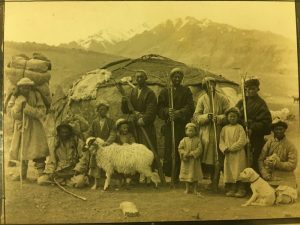 The images were taken over a period of more than thirty years, Stein undertook four expeditions in Central Asia between 1900 and 1930, specifically funded on the promise that he would collect important archaeological and textual artifacts. The result was several publications of work into which the collection is divided; Ancient Khotan (1907), Ruins of Desert Cathay (1912), Serindia (1921), Innermost Asia (1928), On Central Asian Tracks (1933). He undertook a further expedition, this time to North-western India and South-eastern Iran in 1933-34, which resulted in the publication, Archaeological Reconnaissances (1937). The images are a document of Steins travels and discoveries, covering a wide range of subject matter including excavations, architecture, panoramic landscapes, and ethnography. Image form the Stein Collection. ‘Wakhi head-men and carriers at Kok-Torok. Mubarak Shah, ‘Karaul Beg’, Talmish, and ‘Dash’ in foreground’ – from Ruins of Desert Cathay, taken on Stein’s second expedition. To be able to work the collection from beginning to end has been very satisfying, I am proud of what I have achieved, personally, and the contribution I have made to the RAS collection. I have really enjoyed my placement, I have learnt invaluable skills and experience from which I will benefit when I graduate, and would like to thank Nancy and Ed for all their help, expertise and patience over the last 3 months.